Key lime trees (Citrus aurantifolia) supply cooks and culinary artists with the tart and tasty ingredient in the pie that shares the name. 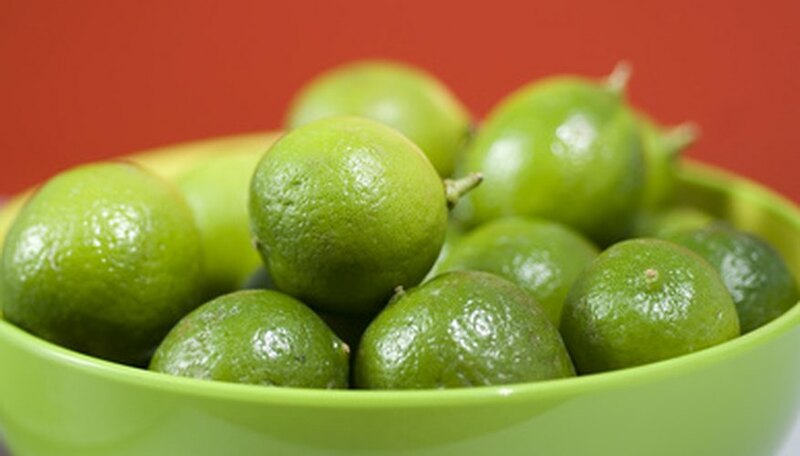 Also known as a Mexican lime and West Indian lime, this type of citrus tree produces small, rounded fruits with thin rinds. Like many types of citrus trees, key lime trees grow well in containers. These trees reach a mature height around 5 feet, making them suitable selections for large houseplants or patio trees. Select a large pot with drainage holes on the bottom. These citrus trees require a 10- to 15-gallon container to allow adequate space for maturing roots. Cover the bottom of the inside of the pot with a piece of screen mesh. This mesh will allow the water to flow out while keeping the soil in the pot. Spread a shallow layer of fine gravel over the mesh to assist in drainage. Mix equal parts shredded bark, peat moss and sand to create a rich medium. Place enough soil in the bottom of the pot to keep the surface of your root ball about 1 inch below the rim of the pot. Transplant your new Key lime tree from its nursery container into your permanent container using this mix. Fill in the sides with soil, but avoid placing new soil over the top surface of the root ball. Water your tree immediately after planting. Slowly add water to the soil until you notice a few drops of water coming from the drainage holes. Grow your Key lime tree in a sunny location. Select an area that receives between 6 and 12 hours of daytime sunlight. If growing your tree indoors near a window, turn the tree every couple of weeks to provide equal amounts of light to all sides. Keep the soil slightly moist near your Key lime tree’s roots. Water the soil in the pot when the surface becomes slightly dry to the touch. Apply the water slowly to allow it to soak into the soil. Stop applying water when it begins to drip from the drainage holes. Fertilize your Key lime tree with a liquid fertilizer labeled for use on citrus trees. Choose a fertilizer that has manganese, iron and zinc. Apply this every couple of weeks in the spring and fall seasons, and about every week during the summer months. Pollinate your indoor lime tree with a small paintbrush. Because indoor, container-bound plants don’t receive visits from honeybees, butterflies and other insects, they depend on you for pollination. Gently flick the center of the blossoms with your paintbrush, going from flower to flower. Do this daily throughout the blossoming period to ensure an abundant harvest. Bring your outdoor, potted tree inside before the first frost in the fall. Freezing temperatures can damage your Key lime tree. It prefers temperatures between 55 and 70 degrees Fahrenheit. Wait until after the final frost in the spring to take your tree outside again. These trees can remain outdoors year-round in warm climates that do not experience freezing temperatures. For the best flavor, allow the fruit to ripen on your Key lime tree until dark green in color.